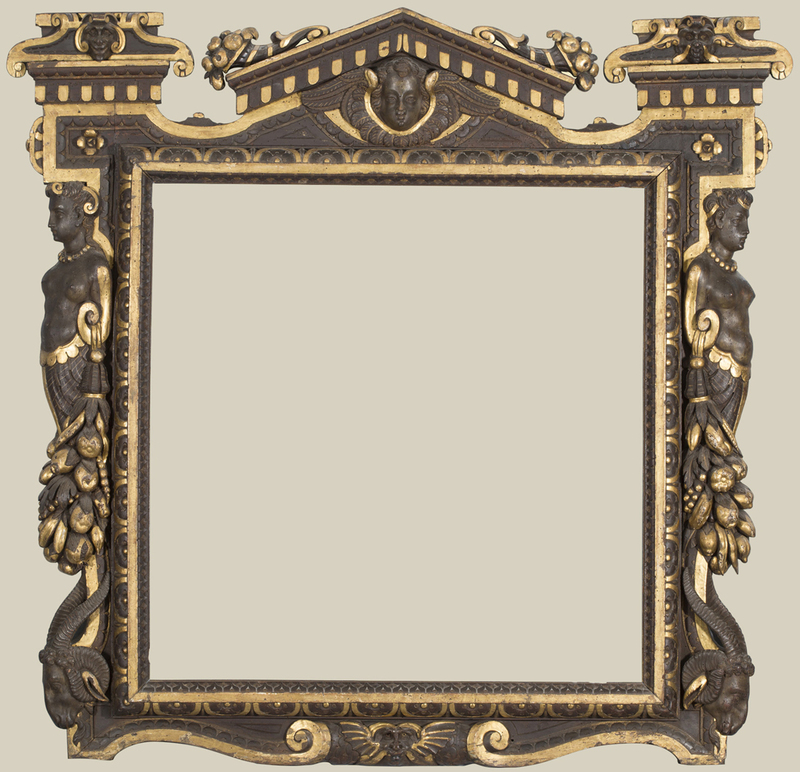 An exhibition at the National Gallery examines one of the most decorative and flamboyant of frame designs; it runs from 1 April to 13 September 2015, and is reviewed here by Michael Savage, otherwise known as Grumpy Art Historian. 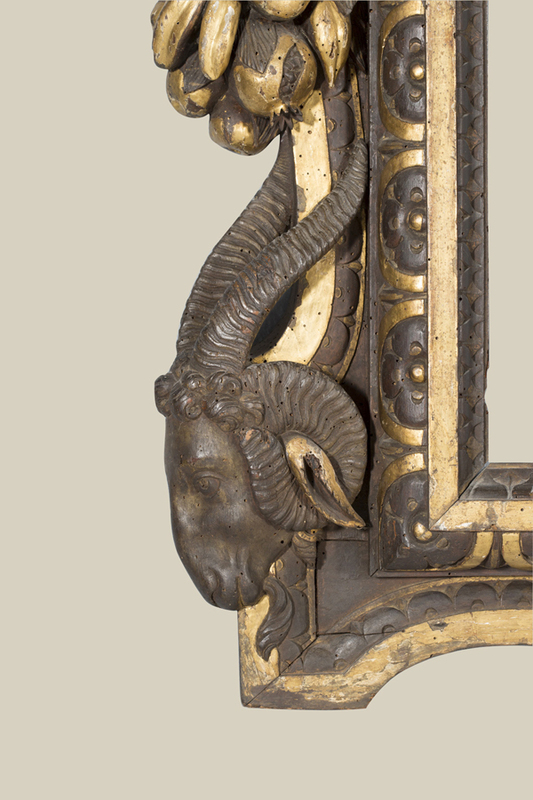 With their scrolls and swags of fruit, cherubim and grotesque masks, dark walnut and shimmering gilt, ‘Sansovino’ frames are a riot of decoration and a marked contrast to the sobriety of the tabernacle frames often used on contemporary altarpieces. They originated in sixteenth century Venice (although probably not with Sansovino) and became popular throughout Europe. Picture frames have a subordinate function, both providing a setting for the picture and playing a part in the overall ‘look’ of an interior. That makes it easy to think of them in only a supporting role and to lose sight of their independent artistry. Frames were expensive and a good deal of thought went into design and execution. 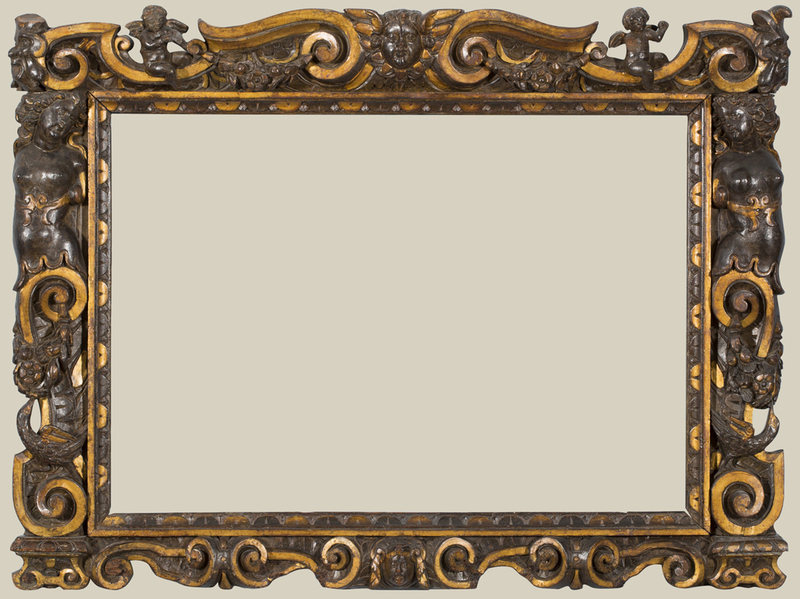 The best frames are finely carved and well conceived. But others are more summary, and more arbitrarily decorative. This exhibition made me appreciate some quite stark differences in quality that aren’t immediately apparent when looking only at the immediate overall effect. The excellent catalogue proposes a later date for the more restrained frames, and suggests that the most wildly decorated were earliest. That suggests that the earlier frames borrowed broadly from sculpture and furniture, throwing together images playfully and exuberantly. The later frames seem to have been conceived with a narrower purpose in mind, more strictly subordinate to the pictures and with form more closely tied to specific purpose. Given the paucity of evidence, the proposed dating must be speculative and I suspect styles overlapped and persisted, but it’s a helpful way of thinking about groupings. Seeing frames without pictures makes you focus on the artistry of the frames themselves, reflecting on quality and style. I always come back to their function, thinking about how they work with pictures and how they function in interiors. Two of the frames do have pictures in them, both recently reattributed to Titian with different degrees of confidence. 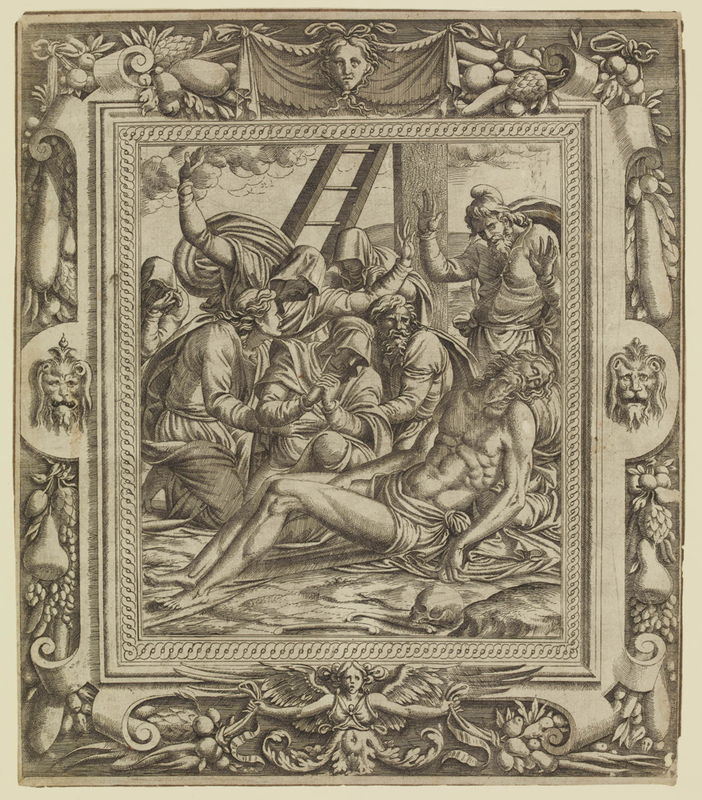 The more likely, the Portrait of Girolamo Fracastoro, was recently reframed in this especially elaborate Sansovino frame. It looks splendid, the exuberance of the frame setting off the dour but swankily dressed Girolamo. It’s not a combination I would have thought of. Some of the more exuberant frames are hard to imagine paired with pictures, but this portrait shows how well they can work. A couple of pictures provided the right balance; more would have diffused attention away from the frames, whereas none at all would have divorced form and function too strictly. I love the fact that there’s a chest on loan from the National Gallery’s own building services department. It illustrates how details on ‘Sansovino’ frames were echoed in contemporary furniture, but the credit line conjures up wonderful images of NG offices looking like Renaissance palazzi; I imagined burly workmen interrupting a curator in his intarsio growlery to cart off a cassone for the frames show. It gives a different context for the frames. They are usually seen only in relation to pictures, but as works of art they often relate more closely to furniture. And that relationship was even closer in 16th century Venice, where cassoni themselves often had painted decoration framed with Sansovinoesque elements. The exhibition is beautifully staged in a single room, frames hung against dark blue walls with substantive and useful wall text explaining the context. A much-quoted and disparately attributed bon mot says ‘I’m writing you a long letter because I didn’t have time to write a short letter’. As with letters, so with exhibitions. The small ones require extra effort to distil the best, and they’re often more rewarding for that. Many of my favourite shows at the National Gallery have been in this little room on the left of the main entrance. ‘The best’ in this case doesn’t mean the finest examples, but rather that they have gathered a selection representative in terms of quality as well as design. It’s been interesting to watch visitors. Some poke their heads in and then leave to seek the paintings. 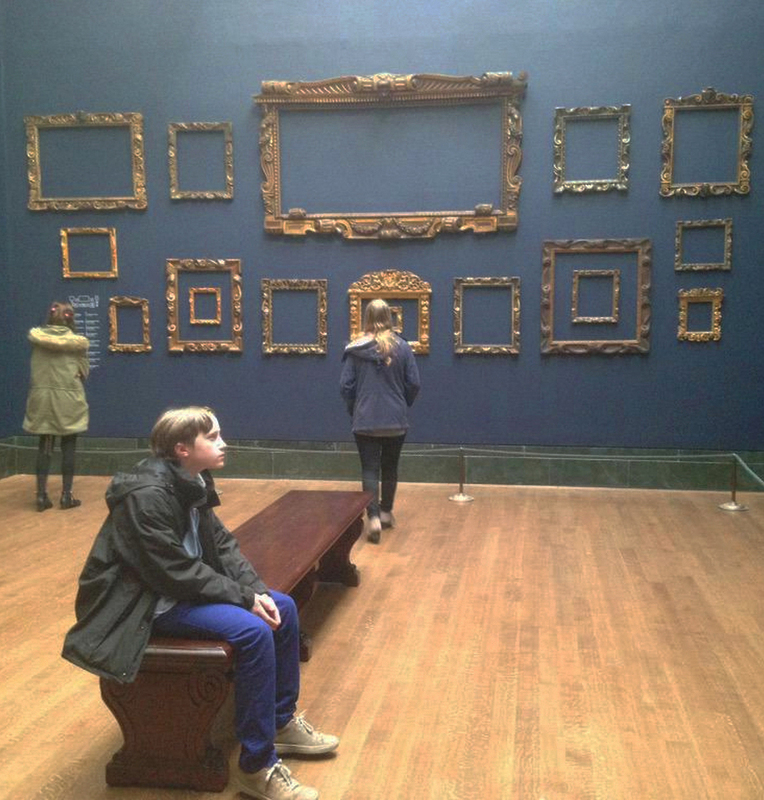 One couple came in to look at the two paintings, then left ignoring the frames. But the people who do visit seem to linger. First time or infrequent visitors understandably want to see the NG’s paintings, but people do want to learn more about the frames. I’ve seen people studying the wall text and catalogue more closely here than in any other exhibition I can recall. It’s commendable that the National Gallery puts on such interesting and unusual shows as well as popular blockbusters. It’s touted as the first in a series of shows highlighting frames, and it has whetted my appetite for the next in the series. Michael Savage is ‘Passionate about the arts, particularly old master drawings and paintings. Keenly interested in history, philosophy, economics and most things in the humanities and social sciences.’ As Grumpy Art Historian he keeps a very beady eye on the more inane doings of the art world, which prompt him into the sort of curmudgeonly criticism that we all whole-heartedly agree with. 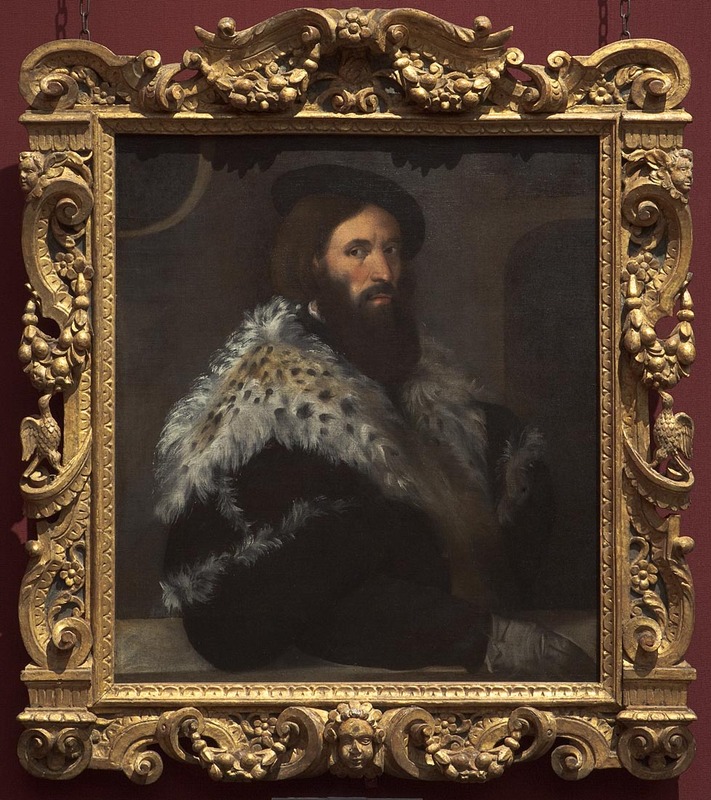 Listen to Peter Schade, Head of Frames at the National Gallery, and Harriet O’Neil, co-curator of the exhibition, talking about Sansovino frames with Anne McElvoy on Radio Three (27 minutes and 42 seconds into the programme). 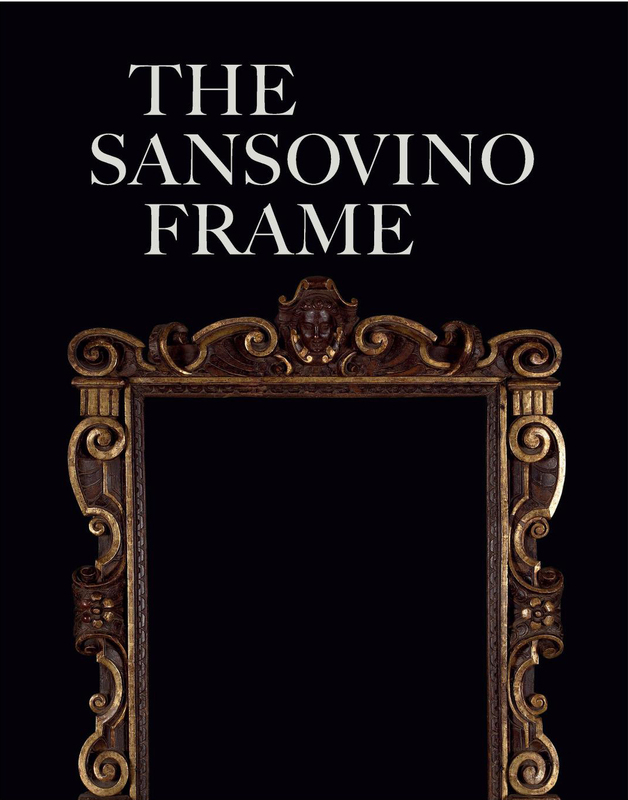 The accompanying catalogue, The Sansovino Frame, is slim – as you would expect for an exhibition of this size – but it’s beautifully produced, and far more substantial in terms of information and depth of scholarship than can be said of weightier, superficially more ‘important’ catalogues. It’s nicely bound, with a double turnback card cover which adds volume and substance, and it has a good picture-to-text ratio, with a section at the back of illustrated entries for all the exhibited frames, so that you can walk round them with the catalogue in your hands: a definite and unusual benefit in these days of monster tomes. The main essay begins with a helpful definition of what exactly is meant by a ‘Sansovino’ frame – its structure, whether architectural, with pediment and base, or symmetrical on both axes, like a linear frame; its ornament (this exhibition has a very high angel count, not to mention greedy birds and some magnificent goats); its finish (gilded, or parcel-gilt and painted, or parcel-gilt and polished walnut); and its stylistic connections (Venetian, Tuscan or Roman Mannerism). We begin to see how various this type of frame may be, an aspect which is demonstrated by the different sizes, designs and complexity of the actual exhibits. 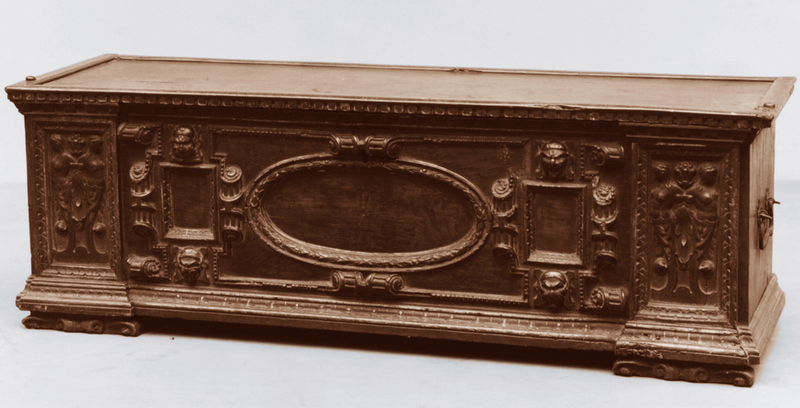 The relationship of frame and furniture is also dealt with, as Michael mentions in his review, above, not only in terms of the cassone, one example of which is on exhibition, but in terms of the diverse objects which were also decorated in ‘Sansovino’ style. 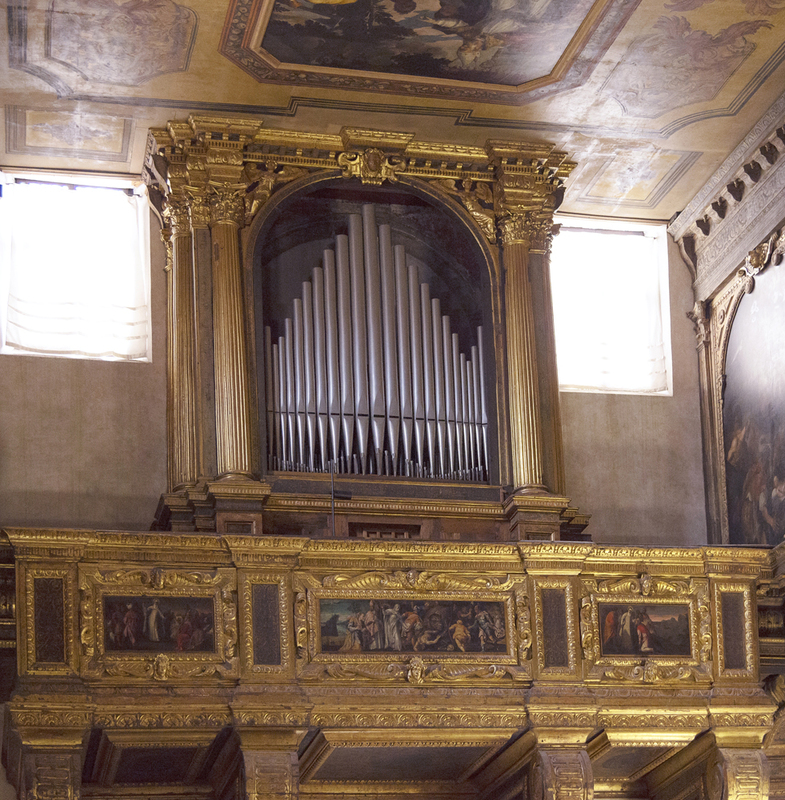 For example, wooden organ lofts, noted as close in structure to cassoni, and like cassoni often decorated with paintings in framed compartments; also wooden ceilings with scrolled ornamental cartouches containing paintings, which date from the mid-16th century. The complicated genesis of this frame style is unpicked; in spite of its name it has always been clear that the latter has come about rather by association than because Jacopo Sansovino himself had any active part in its design. Like the Spanish architect, Juan de Herrera, whose name has also been annexed to a Mannerist style of frame mostly at odds with the severe classicism which characterizes his work, Sansovino’s architectural and sculptural work is very unlike the scrolling Mannerist exuberance of the ‘Sansovino’ frame (notably in an altarpiece setting actually attributed to him, in S. Salvador, Venice). 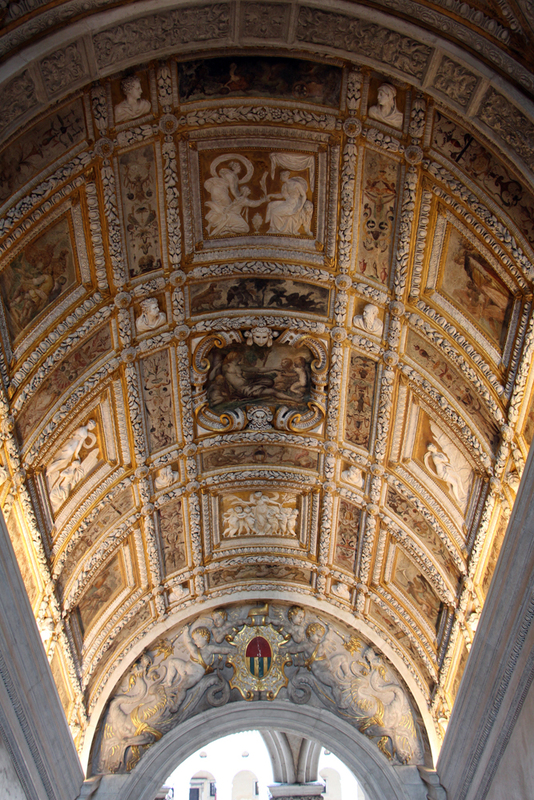 The nearest he is admitted to complicity with the style is relative to the garlanded and voluted stucco ceilings by his pupil, Alessandro Vittoria, for the ceilings of Sansovino’s Scala d’Oro in the Palazzo Ducale, Venice, which ‘…he must have approved’. Vittoria was a young and talented stuccoist, who in 1552, at the age of twenty-seven, was working on the ceilings of the Palazzo Thiene in Vicenza, in which much of the vocabulary of Sansovinesque ornament springs to life in a plethora of curling clasps, flutes, swags of fruit, amorini, and parcel gilding. By 1558 he had started on the stuccowork of the Scala d’Oro, and one strand of the parentage of these frames was in place. The authors are careful, however, to admit the influence of jewellery and engraved designs, noting, for instance, printed representations of the paintings and surrounding stuccowork in the Château de Fontainebleau, such as those by Luca Penni, etched by Jean Mignon. Other ingredients may include heraldic shields, and cartouches – for example, one drawn in c. 1551 by Veronese. 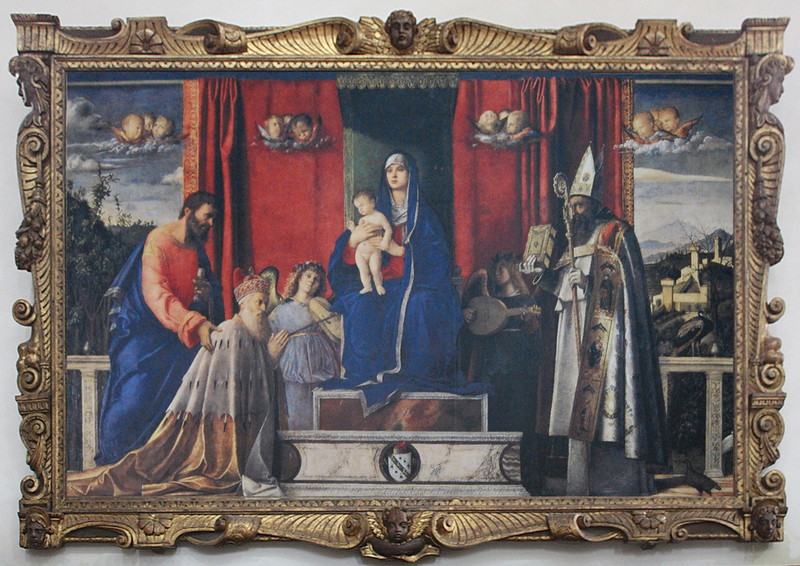 Giovanni Bellini, Madonna and Child with Doge Barbarigo, 1482, in a frame dated 1634, S. Pietro Martire, Murano, Venice. The dissemination of the style is charted, as well as competing patterns of frame in Venice, and its survival there as late as the splendid example (above) on a Bellini. 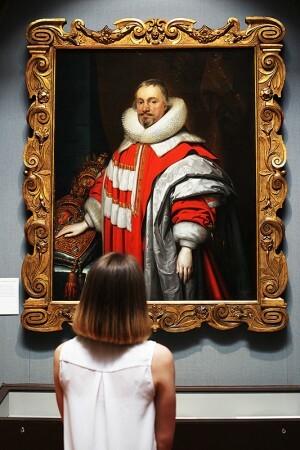 Exactly contemporaneously with this, ‘Sansovino’ frames had migrated as far as Britain, turning up in a typically flattened form on, for instance, the portrait of Thomas Coventry, 1st Baron Coventry, by Cornelius Johnson (1639, National Portrait Gallery). Having reached London, elements of the ornament became naturalized: the authors see them reviving in the decoration of the more elaborate ‘William Kent’ frame, and popping up again in 19th century revivals of the form. Altogether, then, the catalogue delivers an all-round view of this very three-dimensional style, whilst managing to remain remarkably succinct. Like the exhibition, it is a bravura beginning to what is publicized as the first in an occasional series on picture frames. Do go to the exhibition – and, if you can’t get to it, do buy this very useful book. I saw on your blog the Nicholas Penny, Peter Schade & Harriet O’Neill’s catalogue “The Sansovino Frame” and I’d like to have it. I saw also the price, I think no expansive. Can I get it? Do you think that I can find it in Italy ? There are copy in italian version? Thank you for commenting; I’m fine, & hope that you are, too. The catalogue is very reasonable, I think, for the amount of information it contains, as well as good illustrations. Sadly there’s no Italian version, though. I should think that you could buy it through Amazon in Italy, perhaps…? – or from the National Gallery’s online shop (although I don’t know how expensive the postage would be). Catalogue ordered! Finally some success! WOOHOO! Still no word from anyone about the Statens Museum for Kunst catalogue. Still wanting, too. Anyone…help! So glad that you’ve ordered the catalogue – it is a very nice one! I’m really sorry that you’ve not been able to get hold to get a copy of the Danish catalogue – I can’t think of anyone else to contact, unless you try to approach the museum via a curator… Are there any second-hand ones for sale online, I wonder? Perhaps you could try asking on Facebook…? Sorry!